Don't you wish you could find safe, all-natural bath, beauty and beard products that were filled with ingredients that were actually good for your hair and skin? Look no further than Natural Textures! We're a locally owned and operated shop selling handmade bath products made from 100% all-natural ingredients. We use organic and local ingredients wherever possible – give our wine bar and beer bar a try! They're made using wine from Wyldewood Cellars in Mulvane and beer from River City Brewery in downtown Wichita. Our product lineup includes soap bars, body bars, shampoo, conditioners, lotion, sugar scrubs, body butters and fizzy bath salts. Don't think we only have products for women, though!! Men across the country are LOVING our 'Bespoke' line of men's products including beard butters and old-fashioned shave kits complete with brush, shave soap, and aftershave. We use all-natural essential oils and fragrance oil blends but also have a variety of fragrance-free products especially formulated for sensitive skin. Our Oatmeal & Calendula bar is super-moisturizing and especially good for eczema and psoriasis. Ask about our sinus-clearing and anti-acne products, as well. Natural Textures products are sold at events around town and online nationwide. You can often find us at the farmer's market in Wichita; check out our events up top to see where we're selling next! Natural Textures started in 2012 when JaRee Carey couldn't find the all-natural and organic products she wanted in area shops. She took matters into her own hands and taught herself how to make the products she wanted. JaRee and her mother Ranea started gifting their products to friends and family, who in turn fell in love and started gifting the products to their friends and family. Thus a business was born. JaRee and Ranea have since expanded to produce a variety of bath products and scents, including their very popular beard and shaving products. They're happy to work with customers to formulate soaps for special skin and hair needs. The beard butter is an awesome product. Fast friendly service! Placed my order Friday night and had it by noon on Monday. If you have a beard than you definitely need some beard butter! 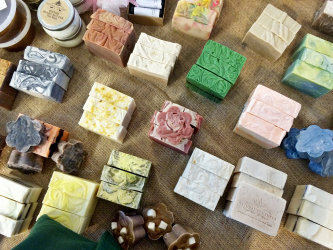 Natural Textures is a proud member of the Handcrafted Soap & Cosmetic Guild and member of From The Land Of Kansas.